Edward Burtynsky: Water is on-view at the Grand Rapids Art Museum through April 26. The exhibit features sixty large-scale Cibachrome photographs divided into the themes of Distress, Control, Agriculture, Aquaculture, Source, and Waterfront. I had every intention of attending the opening of Water in February, but I was waylaid at the I AM reception that same evening, and frankly, I wasn’t eager to see the show. Sometimes you order the side salad instead of fries, because it’s the right thing to do. Such was my sentiment regarding Water. The small reproductions I’d seen in the museum newsletter were unremarkable, and the theme of environmental doomsday sounded tedious. I was terribly wrong. 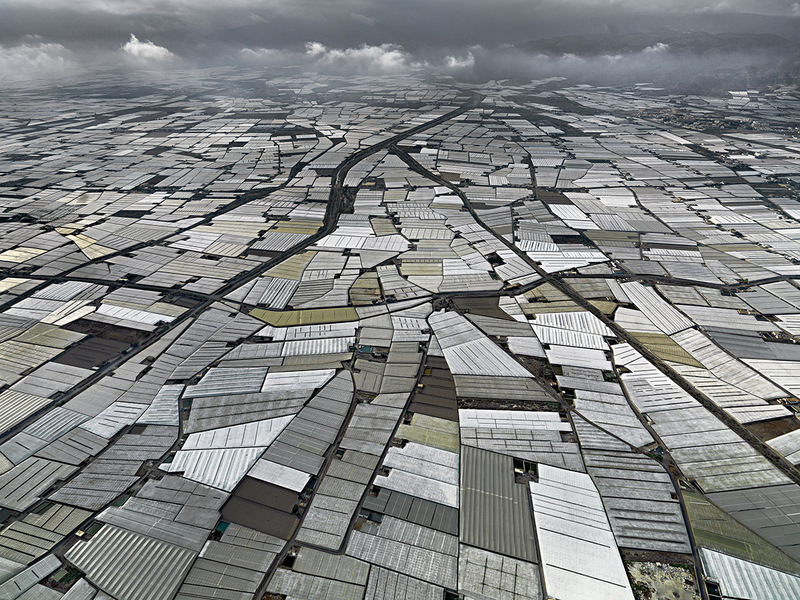 Burtynsky’s series demonstrates art’s seductive ability to provoke and instruct, in a manner that cannot be achieved with journalism or mere statistics. First of all, the theme is our relationship with water, which is more nuanced than man’s adverse impact on the environment. Secondly, the images are really captivating. The aerial perspective makes the decimated or compromised landscapes appear surreal and beautiful. Among my favorites were those of pivot irrigation farming, which resemble variations on Jasper John’s encaustic target paintings. Like the Romantic landscape paintings by J. M. W. Turner, or Casper David Friedrich , the presence of man is often dwarfed by the sublime magnitude of nature. Xiaolangdi Dam #3, Yellow River, Hunan Province China (2011), features water expelling with such quantity and force, that only a fragment of the dam is visible. The oddly menacing Ölfusá River #1, Iceland (2012) looks like a hybrid of Turner’s, Valley of Aosta Snowstorm (1836-37), and Hokusai’s, The Great Wave off Kanagawa. Discerning the function or size of the documented Indian step wells, is like trying to navigate around an M.C. Escher drawing. For example, to gauge the scale of Step Well #4 Sagar Kund Baori Bundi Rajasthan (2010), the viewer has no choice but to scrutinize the garbage for some recognizable piece of detritus. In Stepwell #2, Panna Meena, Amber Rajasthan (2010), nearly a dozen tiers of vertiginous yellow stairs, lead to a pool of water as intensely green as antifreeze. There are many images that record how the environment has been subjected to our appetites. The terracotta roofs and turquoise swimming pools of Stout River Pima Maricopa Indian Reservation (2011), make the mountains and sky seem small and dingy compared to the sweeping subdivision. A looming storm in Greenhouses, Almira Peninsula Spain (2010), is powerless to damage or nourish the sheltered plants. Covered with a streaked patina of soil and rust, Xiluodu Dam #1, Yangtze River, Yunnan Province (2012), appears to be another defunct water structure (like Stepwell #4), but the presence of scaffolding and work sheds indicate that it’s still under construction. Aborted monumental projects such as this seem more tragic than ugly manufacturing facilities or absurd dessert housing developments, because the topography has been ruined for naught. Such images do not elicit much confidence in the collective intelligence of humanity. The archetypal struggle of man with nature appears to be at a stalemate, with neither party winning. 10AM-5PM Tues., Wed., Fri, Sat. I really appreciate the context you put this stunning work into, Tamara.